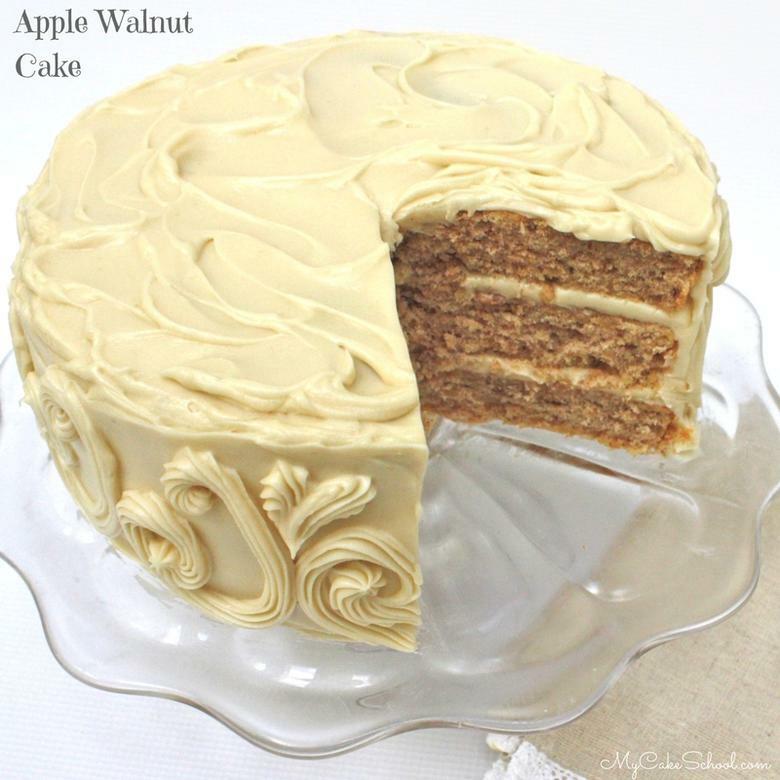 Today we’re going to share an amazing scratch Apple Walnut Cake recipe! 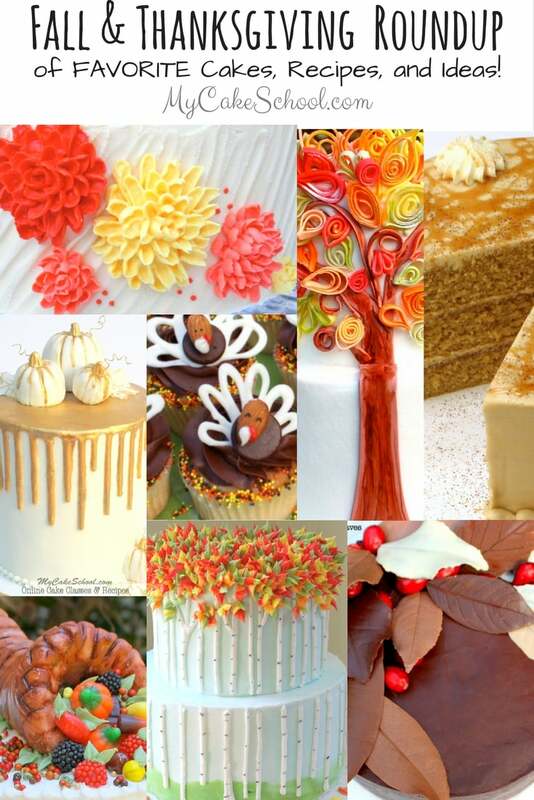 Oh how I love fall and all of the delicious desserts that come with it! This flavorful cake is sure to be a hit at your fall and Thanksgiving gatherings. We’ve shared several favorite fall cakes over the years (including Pumpkin Spice, Caramel Apple Spice, Caramel Vanilla Latte, and more), and this dessert has earned a spot right alongside them at the dessert table. Fall is filled with what I like to refer to as the cozy flavors. The ones that just make you want to snuggle up with a blanket, a cup of tea, and a slice of spiced goodness. Mmmm…. Apples, walnuts, and maple (along with a hint of cinnamon and nutmeg) are the stars of this dessert, and are sure to satisfy those fall cravings. 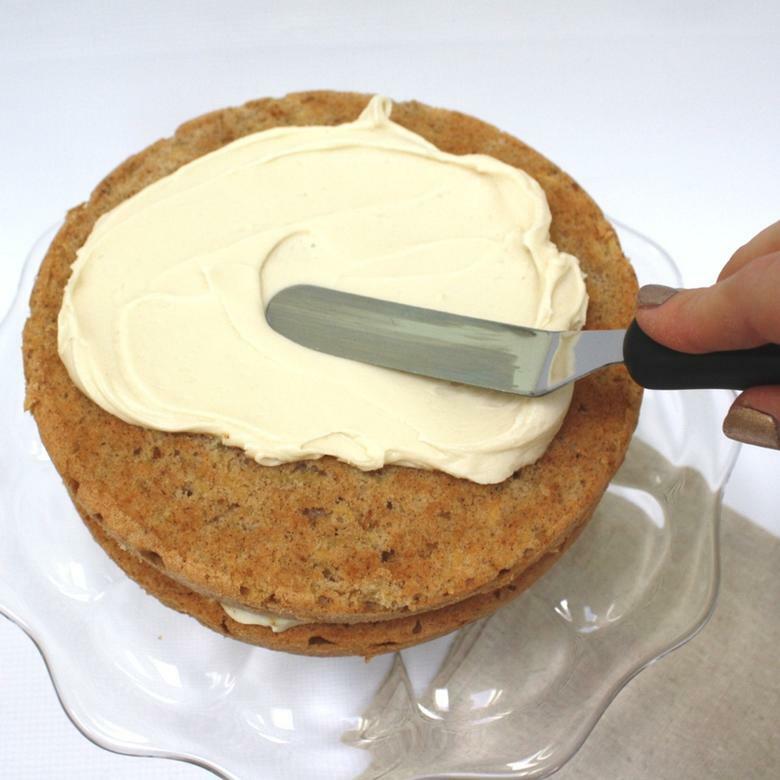 After baking our cake layers, I filled and frosted them with a slathering of the most delicious Maple Cream Cheese frosting. 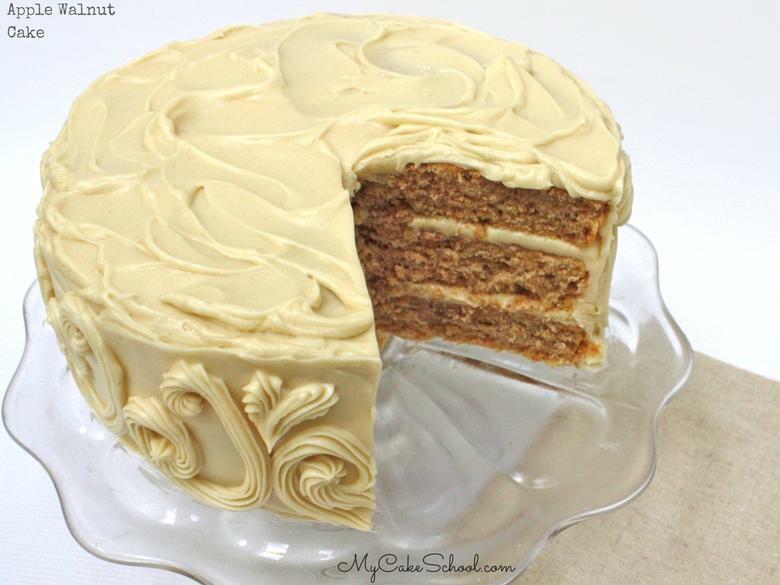 This frosting is silky smooth and oh so flavorful! 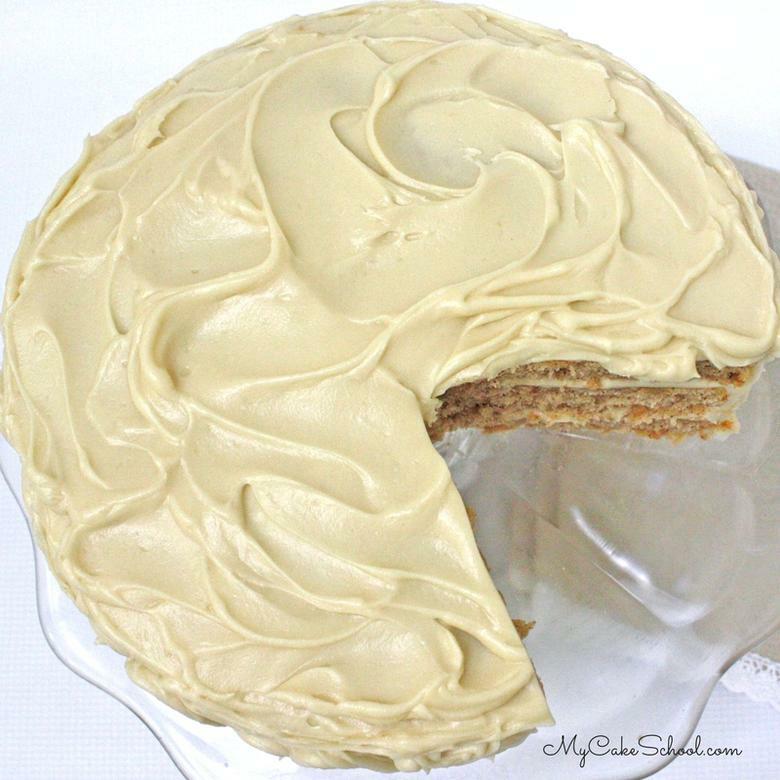 Although Maple Cream Cheese is our frosting of choice for this cake, it would also taste fabulous with our Maple Buttercream frosting (as used in our Maple Pecan Cake). Another great one for fall! After spinning the frosted cake on my turntable with the help of a bench scraper for smoothing, I piped a few simple scrolls around the side with a star tip 21. I let the top remain swirly. I love a little texture in my frosting! We hope that you enjoy this cake as much as we have! Grease and flour three 8 inch cake pans - Add a circle of waxed paper or parchment paper to the bottom of each pan, cakes with fruit can have a tendency to stick. In a separate bowl, add the flour, baking powder, baking soda, salt, nutmeg, and cinnamon. Whisk at least 30 seconds to blend. Set aside. In the bowl of your mixer, mix the butter until smooth. Add the sugar and mix at medium speed for 3 to 5 minutes or until light and fluffy. Add the the oil and vanilla and mix until blended. Mix until just combined, do not mix above medium speed or over mix. By hand, stir in shredded apples and chopped walnuts. Pour into prepared pans, smoothing tops with the back of a spoon. Bake at 350 degrees for 25 to 30 minutes or until a toothpick inserted in the center comes out clean or with just a few drums attached. Let cool 10 minutes, then turn out of pans. Cut the cream cheese into pieces and add to the butter, mixing on medium speed until well blended. Gradually add powdered sugar and mix until well blended. Do not over mix or beat above medium speed . If beaten too long it will become very soft. If this happens, just put in the refrigerator for a short while to firm it up a bit, then frost the cake. This frosting will pipe best if used while chilled. You can make in advance, refrigerate and when ready to use let it soften slightly and remix. Do not microwave to soften. Thanks for stopping by! And for even more fantastic Cake Recipes, hop over to our Cake Recipes Section for our tried and true cake and frosting recipes! stir and allow to sit for five minutes. with fruit can have a tendency to stick. Mix until just combined, do not mix above medium speed or over mix. By hand, stir in grated apples and chopped walnuts. 2 8oz packages cream cheese (453 total gram weight) softened very slightly. Use full fat cream cheese. Do not use reduced fat cream cheese or cream cheese in the tub containers or the frosting will be too soft. I made this recipe into cupcakes. They were very good. Thanks for sharing . Hi Wendy, So happy you tried the recipe!! Thanks so much for posting your thoughts. does this cake freeze well, not sure if the nuts would change the texture a bit. Hi Jessica, This cake should freeze well for you.